SAN GABRIEL VALLEY >> A spherical object spotted hovering silently over the San Gabriel Valley this week had residents gazing skyward and wondering what they were witnessing. The object appeared in the sky over the San Gabriel Valley Monday morning. One video, posted by YouTube user Julian Lopez, appears to show a Los Angeles County Sheriff’s Department helicopter circling around the object for an inspection around 7 a.m. over West Covina. “Well, my friends, there’s a UFO over the San Gabriel Valley,” the videographer said. While the object resembled a large balloon, “There’s nothing holding it down, though. That’s the thing,” Lopez. Lopez said he had just finished washing his car when he spotted the object out of the corner of his eye. The sphere was metallic gray in color and made no noise, he said. “It was just weird because it didn’t budge,” Lopez said. The witnesses went into his house to tell his 6-year-old son to come take a look, as well as to retrieve his cell phone to record video. The man and his son watched as two helicopters flew in close proximity to the object. At least one of them circled around it before leaving the area. After sitting motionless for several minutes, the object slowly began moving toward the west, Lopez said. He had to stop recording in order to prepare his kids for school and go to work. But another witnesses in Arcadia spotted and photographed the object several hours later, about 10 miles to the northwest. Daniel Acosta was with his wife when they noticed the metallic object floating motionless in the sky. Acosta estimated the object was hovering at least 1,000 feet above Altadena and appeared to be 6 to 10 feet in diameter. “It’s the strangest thing. I have no idea,” he said. The object’s lack of motion was particularly striking, he said. Officials at the sheriff’s Aero Bureau said a sheriff’s helicopter often checks out potential airborne hazards that are spotted in the sky, but no information about the object was available Sunday. The crew that manned the helicopter on Monday morning was not on duty Sunday. Local police and sheriff’s officials had no information regarding the sightings, and Federal Aviation Spokesman Allen Kenitzer said he also had no information regarding the incident, which resulted in no report by the FAA. The National UFO Reporting Center keeps a database of unusual sighting in the sky, however, reports from Monday were yet to be uploaded to the archive over the weekend. 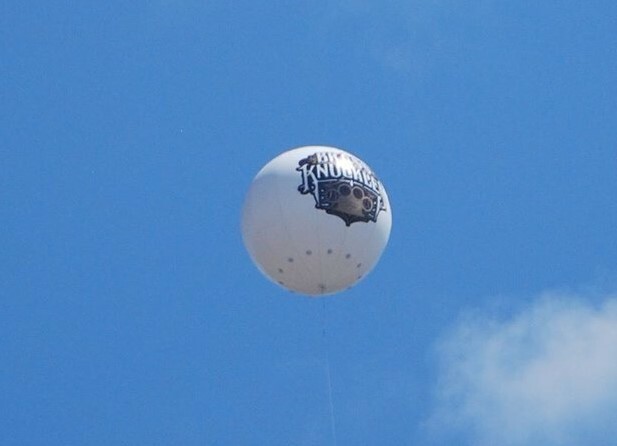 As conversation and speculation about the object swirled through the community, both online and real, local sleuths offered a possible answer to the mystery: an advertising balloon. “I noticed the UFO Monday around 10 a.m. from Monrovia,” Jon Gollihugh said in a email. “It was (hovering) over the mouth of San Gabriel Canyon. There was a large buzz about it on Facebook with residents of Sierra Madre. Several witnesses reported seeing a large, white advertising balloon emblazoned with a corporate logo in the same time and vicinity of the object. One photograph captured the logo of a company called “Brass Knuckles,” which sells marijuana extracts and vaporizing products. Lopez said the incident has left him more curious. “I’m kind of looking up more at the sky,” he said. 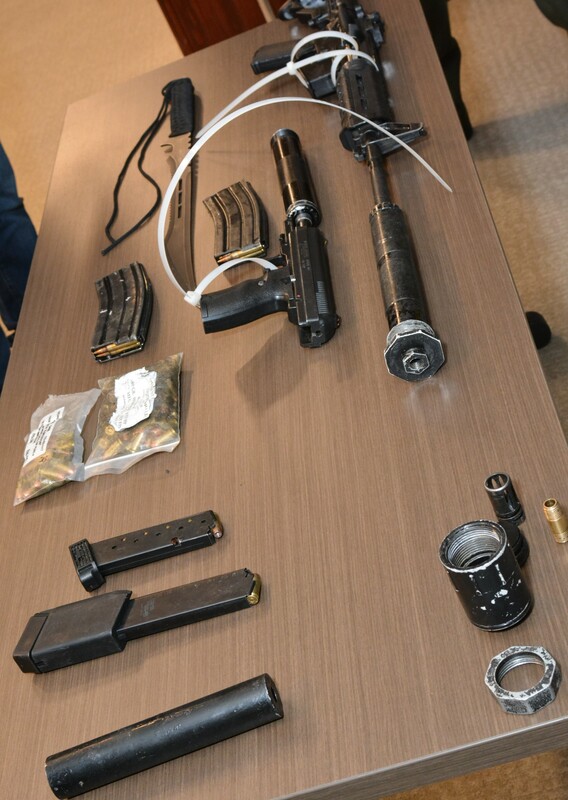 PASADENA >> What began as an investigation into public urination at a Pasadena Gold Line station on Wednesday led deputies to seize two guns, high-capacity magazines, suppressors and a machete from the suspect’s duffel bag, authorities said. Deputies first approached a man about 9 a.m. after spotting a man relieving himself in a planter along the sidewalk outside the Sierra Madre Villa Gold Line Station at Madre Street and Foothill Boulevard, Los Angeles County sheriff’s officials said. The deputies confronted the man about the offense, and the suspect provided them with what turned out to be a false name, according to Deputy Katherine Zubo of the sheriff’s Transit Policing Division, who took part in the arrest. The man was carrying a duffel bag with him. A search of the suspect’s bag turned up a loaded AR-15-style rifle, fitted wit with two 30-round magazines and a suppressor, as well as a .40-caliber pistol with a high-capacity magazine and a suppressor and a large machete-style knife, Sheriff Jim McDonnell said. The bag also contained a notebook full of writings and a Bible. He was booked for weapons violations. “Marking on the handgun specified its use for restricted law enforcement or government only,” sheriff’s officials said in a written statement. Investigators said they had not determined what the suspect, identified as 28-year-old Christopher Harrison Goodine of Union City, Georgia, may have ultimately intended to do with the weaponry. “There is no intelligence to indicate there is a nexus to terrorism,” the sheriff’s said. But he noted that any time a person is walking around with this type of armament in a duffel bag, “The outcome would not have been good no matter what he was going to do,” McDonnell said. Goodine was believed to have boarded a train in Chinatown before exiting at the Sierra Madre Villa Station in Pasadena and encountering deputies, Zubo said. Other than the public urination, Zubo said Goodine was not doing anything that would have attracted attention. The deputy said she was glad she and her colleagues found the weapons before they became involved in a tragedy. “Upon finding the bags, honestly, the first thing I felt was relief, because we got to this stuff first,” Zubo said. McDonnell praised the actions of the involved deputies. “Their proactive actions are commendable,” he said. According to news reports and records, a man of the same name and birth month has faced similar allegations on the East Coast. A Christopher Harrison Goodine, then-26 and a resident of New Rochelle, New York, was arrested in November of 2015 after trying to sneak into the Waldorf Astoria Hotel in New York City while wearing body armor and carrying an empty gun holster and a ski mask, according to the New York Daily News. He told police at the time he wanted to take a shower. Information regarding the ultimate outcome of the case was not available Wednesday. Records show the same man jailed in connection with the New York incident has multiple convictions around the country, including carrying a concealed weapon in Virginia in 2012, obstructing justice by force or threat in in Virginia in 2012 and obstructing police in Georgia in 2013. Records also show arrested in Florida and Washington, D.C.
Deputy Juanita Navarro-Suarez of the sheriff’s Information Bureau said officials could not confirm whether the suspect arrested in Los Angeles County was the same man previously arrested on the East Coast. According to county booking records, Goodine was being held in lieu of $10,000 bail pending his initial court appearance, scheduled Friday in the Pasadena branch of Los Angeles County Superior Court. — Staff writer Larry Altman contributed to this report. ALHAMBRA >> Police arrested an auto burglary suspect and recovered a stolen backpack containing a personal items including the cremated remains of the victim’s father on Tuesday, authorities said. Officer Zachary McFarland as on patrol Tuesday morning when he noticed a man, who appeared to be transient, carrying two backpacks in the area of Atlantic Boulevard and Mission Road, Alhambra police officials said in a written statement. The officer approached the man and soon learned he was on probation for robbery and obtained permission to search the backpacks, which contained a laptop computer, documents and other items. “Additional items and a somewhat unbelievable story from the transient led Officer McFarland to the conclusion that the backpacks may have been stolen. The transient was arrested,” according to the statement. After working for several hours to determine who the backpacks belonged to, McFarland identified the owner, an area man whose car was broken into the previous night, police said. “While happy that his computer and work related material were found, the victim was especially concerned about a small box that he had in one of the packs,” according to the statement. The box was recovered along with the other property. The suspect’s identity was not available Wednesday. LA HABRA >> Police arrested a man for drug possession after finding him living in an elaborate makeshift shelter set up on top of a La Habra auto parts store late Saturday. Employees of O’Reilly Auto Parts, along Whittier Boulevard just east of Hacienda Road, called police shortly after 10 p.m. to report hearing footsteps on the roof of the building, La Habra police Sgt. Rob Diehl said. Officers climbed up onto the roof and discovered the source of the noise. A man had set up a small but well-furnished living space under the eaves overhanging the roof, police said. It included a queen-size bed and a toilet fashioned from a bucket and a toilet seat. While it was unknown how long the man had been residing on top of the auto parts store, “He must have been up there quite a while,” Diehl said. Police also discovered the man was in possession of methamphetamine and paraphernalia, he said. Martin Rowe, 45, was arrested on suspicion of possessing the contraband before being released with a citation, Diehl said. ARCADIA >> A woman had to be freed by firefighters after locking herself in handcuffs last week, officials said. Firefighters responded to the Arcadia Police Department, 250 W. Huntington Drive, on Thursday after a woman arrived at the police station to seek help, according to Arcadia Fire Department logs. The woman required no further assistance once freed from the handcuffs, officials said. The incident was not the first time in recent memory that a local resident have required help from authorities to free them from self-placed handcuffs. A man arrived at the Alhambra Police Department just over a year ago on Nov. 20 of 2015 with a similar problem. After confirming the man’s story, “the subject was freed fro mhis own arrest and happily sent on his way,” the statement said. PASADENA >> An ex-con shot and wounded himself, and grazed a waitress with a bullet, when a gun he was carrying went off accidentally inside a Pasadena Denny’s restaurant on Saturday night, police said. The incident unfolded about 10:10 p.m. at the diner, 2627 E. Colorado Blvd., Pasadena police Lt. Jason Clawson said. A bullet struck the man in the hand and leg, and also grazed a waitress, Clawson said. The waitress, 36, suffered a minor injuries and was treated by paramedics at the scene, he said. The gunman fled the restaurant before police arrived. But police said they soon found the suspect’s car in the parking lot of a nearby hospital. The suspect, a 32-year-old man, was inside being treated for his wounds, Clawson said. He was listed in stable condition. Police determined he was a convicted felon, barred from possessing a firearm, he said. Officers recovered a revolver from his car. Deandre Stringfellow, 32, of Pasadena was expected to face a charge of being a convicted felon in possession of a firearm once released from the hospital, officials said. ARCADIA >> Rescuers freed a young deer from a predicament after the animal became stuck in a backyard fence in Arcadia over the weekend. 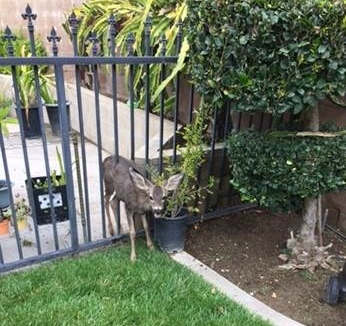 Officials received word about 11:30 a.m. on Friday that the juvenile doe — a deer, a female deer — had become stuck between the bars of a metal gate in the 1200 block of Oakhaven Avenue, Arcadia Fire Department officials said in a written statement. The animal was nor worse for the wear, officials said.